Skybox Security provides a comprehensive platform to automate security management processes such as vulnerability management, threat management, firewall security policies, and firewall change management. 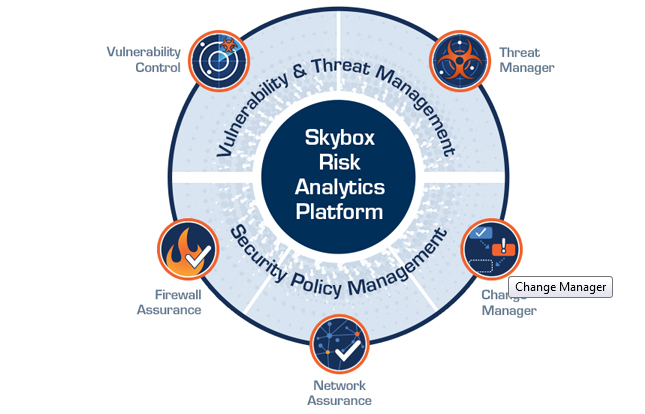 Skybox Vulnerability Control (formerly Risk Control) â€“ The only integrated security management solution that combines vulnerability discovery, automatic risk prioritization, and remediation workflow to effectively reduce cyber risks. Skybox Threat Manager â€“ Evaluates the latest threat intelligence against the context of an organizationâ€™s assets, highlighting potential business impacts and automatically prioritizing vital threats. Skybox Firewall Assurance â€“ Examines firewall rules and configurations automatically to keep the network secure, optimized and in compliance with regulations and policies with minimal effort. Skybox Network Assurance â€“ Provides complete visibility of the network topology and fast answers to network device configuration and connectivity questions in seconds. Skybox Change Manager â€“ Automates the workflow of firewall change management process.